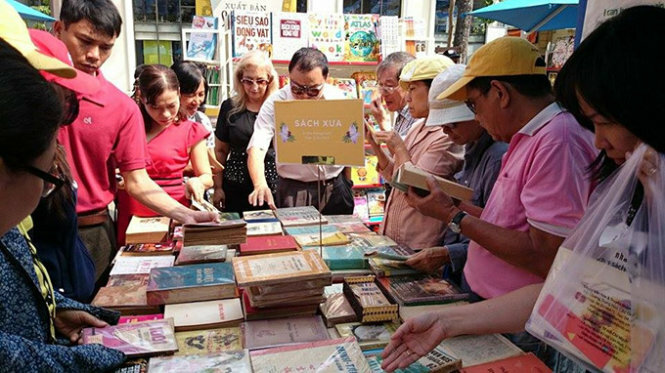 Vietnamese author/translator Truong Van Dan and his wife Elena (center) are seen perusing rare books at the 2015 Tet (Lunar New Year) Book Street in Ho Chi Minh City. The 2015 Tet (Lunar New Year) Book Street, one of Ho Chi Minh City’s cultural icons, generated almost US$210,000 in turnover, which is an unexpected increase in comparison with last year. The book street, which kicked off on Ham Nghi Street in the downtown area on February 16 and closed on Sunday, yielded VND4.5 billion (US$209,712) in total revenue, a 32.5 percent rise compared to the 2014 event, according to the organizer. The rise came as an unexpected success to the organizer, as the festival had its venue changed for the first time, which was thought to pose difficulty for visitors. During its four previous editions, the book street was held on sections of Mac Thi Buoi, Nguyen Hue, and Ngo Duc Ke Streets, all in the downtown area. During the 2015 event, a total of 82,434 book copies were sold, up by over 64 percent compared to last year. The organizer noted a particular public interest in the sections where rare, time-honored books were displayed and used books were traded for new ones. Over 4,000 visits were paid to the vans that served as mobile libraries during the time when the book street was organized. The vans offered a wide variety of books, including those on Vietnamese seas and islands, for visitors to choose from and read on the spot. This year’s best-sellers were books on seas and islands, followed by those on southern Vietnamese culture and translated novels.  The book street, having “Ban Sac Viet-Hao Khi Vietnam” (Vietnamese Identity-Vietnamese Spirit) as its theme, featured sections of e-books, children’s books, books for the visually impaired, and rare, critically acclaimed tomes. One of the key sections showcased photos, archives, maps, and other historical evidence as well as the latest materials on Vietnam’s Truong Sa (Spratly) and Hoang Sa (Paracel) archipelagoes. The week-long iconic flower street, which ran simultaneously with the book street in the downtown area, also came to a close on Sunday evening. This year’s flower street, themed “Vietnamese Identity and Spirit,” showcased some 120,000 pots of flowers of varied kinds, which were gathered from several places across the country, including Sa Dec City in the southern province of Dong Thap, Da Lat City in the Central Highlands province of Lam Dong, and some plant companies in Ho Chi Minh City. One of the flower street’s highlights was the floral “prototype” of a modern subway system whose completion is scheduled for 2017. The flower street has been held annually since 2004 on Nguyen Hue Street, but was relocated to Ham Nghi Street this year as the former is closed for the construction of the subway system, the first of its kind in the southern hub, which has a total length of 19.7km, including a 2.6km underground part. The subway is designed to run through 14 stations, with three underground stops, and connect Ben Thanh Market in District 1 with Suoi Tien Amusement Park in Thu Duc District. The flower street has grown into one of the city’s signature events during Tet – the Southeast Asian country’s biggest traditional holiday – and receives a few million visitors, including foreigners, each year.